Best I can tell from the handy 'Countdown to UEFA Champions League Wembley London Final 2011,' the FC Barcelona v. Manchester United game should kick-off at precisely 2:45 p.m. eastern. It's a match between the two best club teams on earth, worthy of not only U.S. network coverage but a day when there are no pesky distractions involving men throwing balls through hoops or skating around on ice hitting rubber with wood. 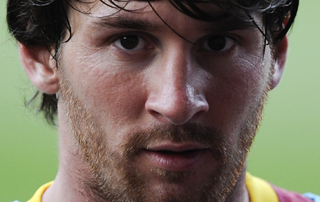 Messi can employ any option that presents itself to him … and if not, invent something totally new. He is different from all the rest. If you even care about my prediction, here it is: 3-2 Barcelona. Both defenses are vulnerable to giving the other side's offensive power just enough of an opening to put a few in. Chicharito's teetering on the edge of doing something to hoist himself into the world's best players rankings. And Wayne Rooney has just been stellar this season. Still, Barca could come out and just throttle Man U like they did to Real Madrid in November. They're loaded with talent, and they're on the precipice of hoisting themselves atop the all-time world's best club teams list. There's no way to tell, though, and that's what makes soccer great. Lionel Messi: Boy Genius [New York Times] (If it falls behind a paywall from some reason, I posted a brief excerpt on my site).